Home » BJJ Books & DVDs » Can I learn Brazilian Jiu-Jitsu from books, DVDs, videos, etc.? Can I learn Brazilian Jiu-Jitsu from books, DVDs, videos, etc.? Instructional materials like books, DVDs, steaming videos, apps, and webinars are all useful supplements to Brazilian Jiu-Jitsu training, but they aren’t enough on their own. To really learn BJJ, you still need to be going to a BJJ gym to practice under a qualified instructor and have access to experienced training partners. You need someone teaching and mentoring you who can give you meaningful feedback and develop your fundamentals. Speaking from personal experience, I’ve watched more instructionals than most mortals, but the moves I use most are still those I learned from my instructor. An instructor can observe you and give you feedback and corrections that an instructional cannot. Where instructionals are useful is studying a particular fighter’s style, or going into more depth on moves that aren’t covered much in a standard BJJ curriculum. What are some good BJJ instructional DVDs for white belts? 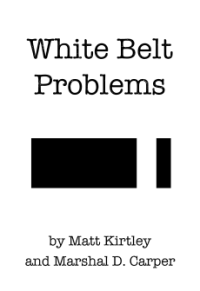 What are some good BJJ books for white belts?